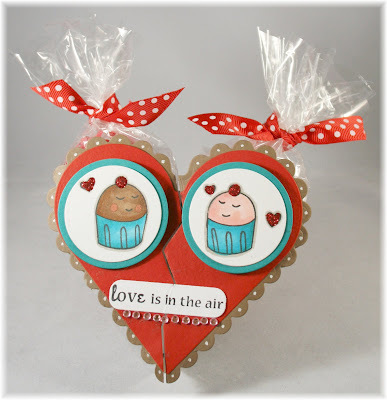 Stamp a Sweet Impression: Hearts Galore! Hi All! I know you've already been enabled with all kinds of adorable creations from the fabulously talented Baker's Dozen but I thought I would try a bit more *wink*! I am seriously in LOVE with all the new stamps that are now available at Taylored Expressions. I decided to go with the "Year of Sweets 1" and the "Love is Sweet" set for the sentiment. The idea for this project was inspired by a heart cookie container I made for the release. I used my heart nesties again for this project along with some vellum. I hand drew the broken heart edges and maneuvered the vellum so it would follow the creases. I think next time I will try and score them first. I guess it didn't turn out so bad for my first attempt. 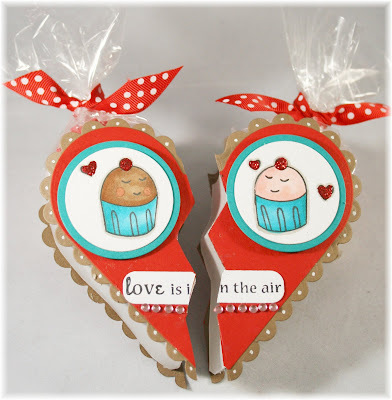 Each heart side is filled with candy and tied with some yummy ribbon. The paper and ribbon are from the new Valentine's Day Key Ingredients. Well, that's all I have for you today but make sure to check back for some more great card and project ideas. okay...so are the tops glued on to the vellum too? Could you show another view of the boxes? They are so stinking cute. I went and saw your other tutorial. That was so amazing. I can't wait to try it. This is so adorable, Ana! What a neat idea! This is fabulous Ana! What an awesome project. Love how you did the broken edges... so creative. TFS!